This “Autumn Elegance” project has to be made up to see how beautiful it actually is. It would be perfect in a black matted picture frame. The brown grocery bag, after it is prepared for this project, looks like leather. And the gold glitter glue sets the black and gold motif off beautifully. Directions and patterns for this, “Autumn Elegance,” project can be found in the Thanksgiving Projects Gallery in the sidebar. This entry was posted in Fall Projects, Thanksgiving and tagged autumn elegance, autumn leaves art, autumn leaves craft, brown grocery bag, childrens thanksgiving art project, thanksgiving art for kids. Bookmark the permalink. How do you get directions for a project? I would like to have my daughter’s 4th grade class do the Leaf Elegance project. Thanks. 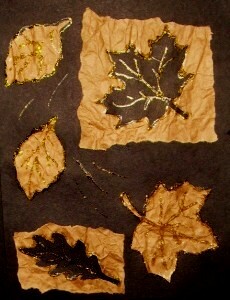 I would love to get directions for the Leaf Elegance project on your site. Thanks.